Anna Shares Spaghetti - A Change for the Better! Anna and her family visit Amorgos every summer to take a break from their busy lives in the city of Athens. Anna’s mom also believes spending time in Amorgos is a wonderful chance for the children to experience life closer to nature. But in the past, the cats of Amorgos looked so sickly that Anna’s mother would not let her children near them for fear of disease. 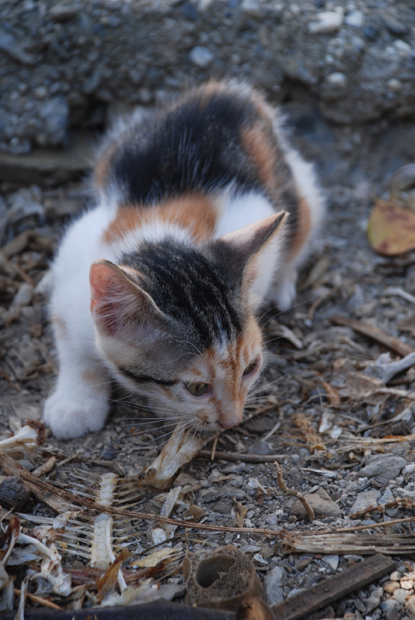 Now, after three years of AZI’s work in Amorgos, the cats are noticeably healthier. And with that knowledge, Anna’s mom is happy to let little Anna play, feed, touch and hug the cats near their summer home. Anna is pleased to have the opportunity to play with her furry four-legged friends! Last year, when she was only 1 1/2 years old, Anna shared her bowl of spaghetti with a couple of cats from AZI’s program. This summer, see how much Anna has grown and the cats are happier and healthier too! August 2009 - At the end of August the man who collects garbage found another newborn kitten in a can in Kato Meria and called AZI’s volunteer for help. This one was 1 week old, with eyes still closed and hopefully will make it just fine like the other three ones. The other animals of Amorgos that are in need of urgent attention are the mules and donkeys. The European community has called for a census of their population, as it clear to all that their numbers are rapidly dwindling. In Amorgos the mules are typically kept with no shelter and with their legs tied to impede their movement “so that they do not trespass”—the official excuse. In reality, in an effort to obtain some freedom of movement, the animal causes hideous self-inflicted wounds which, if not properly treated, can easily become infected and brings the animal to an untimely death. Carelessness and die-hard habits are the rule. When found sick or of no use, they are abandoned with no food or water. The EU has a plan offering a census and free assistance for the mules who, at this rate, will soon find themselves on the list of endangered species. The Mayor of Amorgos has so far refused to submit an application for the free program, despite the repeated suggestions of some members of his staff. AZI intends to put pressure to the municipal council to submit an application for this program. 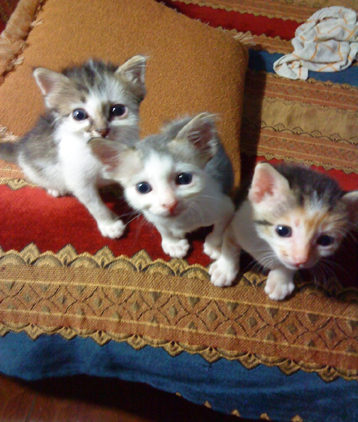 Dewey, Huey and Louie (all female) were found in a garbage can in the area of Rachidi when they were only 1 day (!) old—their umbilical cords were still on them. One of AZI’s volunteers took them in her house and did her best to keep them alive. She followed the veterinarian’s orders on how to bottle-feed them every 2 hours, how to take care of their closed eyes so that they wouldn’t get infected, and how to keep them clean, warm and safe. Her efforts was a big success, as now all 3 cats are now 2 months old, can eat by themselves, and are very healthy, active and playful.